In the late 1960’s professional diving organisations worked closely with the Swiss watch industry to produce reliable underwater-capable timepieces to accurately measure their operator’s ‘bottom time’. The direct result of these collaborations are classics such as the Rolex Sea Dweller, Doxa Sub models, Omega PloProf and Jenny Caribbean. In fact, by the close of the 1960’s straightforward three-hand dive watches were available from almost all the quality watch manufacturers, but chronographs designed for underwater use were however less easy to find. 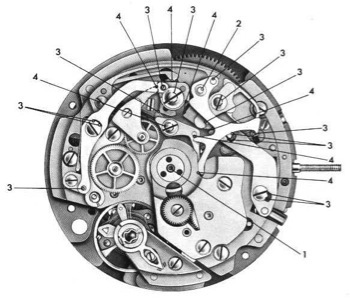 The issue of sealing the chronograph pushers would seem to be the prime mitigating factor, but another reason is that contemporary chronographs were less useable underwater due their busy dials, particularly as most used a subdial for the minutes totaliser. A minute (in both senses of the word) subdial lacks the instant visual impact of a full sized hand and makes it difficult to read the display ‘at a glance’ on the surface, let alone underwater. Continuing its close physical and mechanical similarities to the Speedmaster Mark III, the SM120c also shared its sibling’s initial naming anomaly in that it was not branded as a ‘Professional’ model. 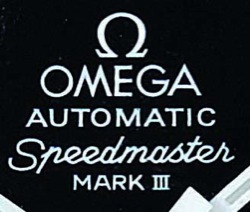 The Mark III was offered both as "Omega Automatic Speedmaster Mark III" and eventually as the "Omega Speedmaster Professional Mark III Automatic", according to the dial printing. The Mark III only gained the word “Professional” on watches produced after 1973. 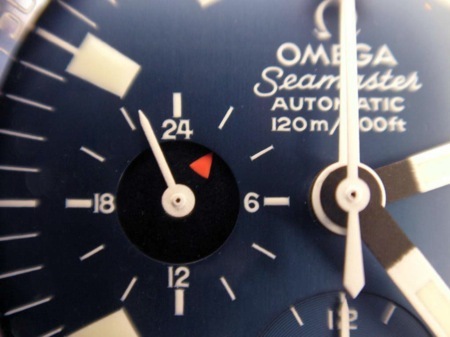 It is highly likely that Omega originally designed the SM120c dial back in 1970/71 at the same time as the original Mark III dial, conceivably using the same team. 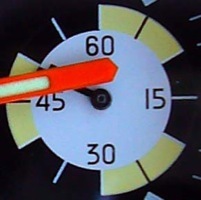 Perhaps all the SM120c’s were built before the Mark III’s name change took place, or Omega sold less SM120c’s than Mark III’s and had enough dials from previous production runs and chose not to redo the dial mask. 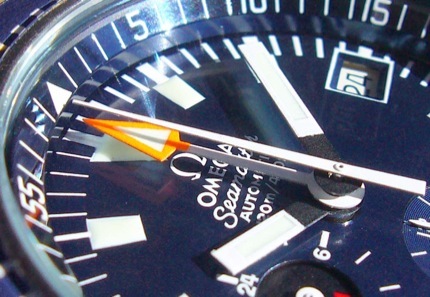 Another school of thought, is that whilst the SM120c was marketed to the dive industry (hence it sports pedigree with the Seamaster nomenclature), and even though it was the ‘first chronograph watch operated at a depth of 120 meters’, it was still not considered a ‘Professional’ Seamaster (i.e. 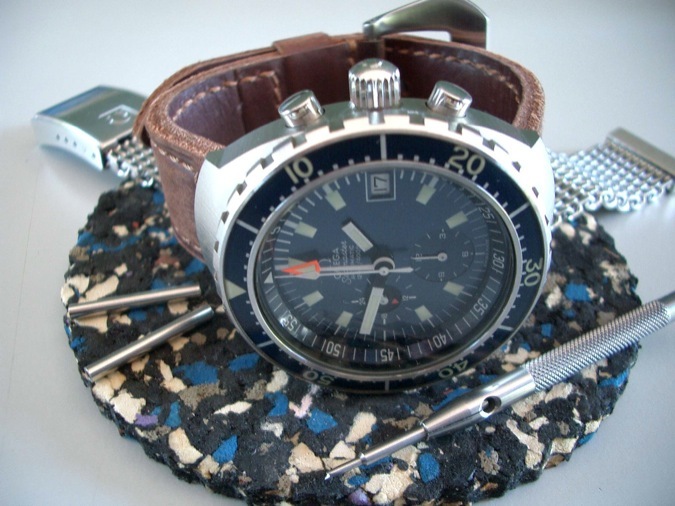 a Professional dive timepiece) as that honour was only applied to watches with a water resistance rating of at least 300m. Another issue with traditional three hand dive timing watches is that they use the minute hand along with the bezel to display the dive time. 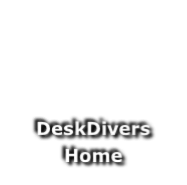 However, a diver does not always submerge on the hour and as such the hand used to time the dive, invariably starts from a different position on the dial for each dive. 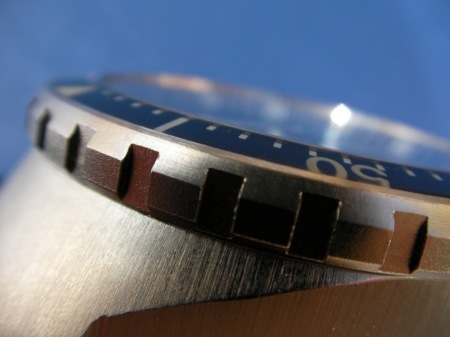 The bezel pip is used to indicate the position of the minutes hand when the dive begins, and the wearer reads the elapsed time from the position of the minutes hand relative to the bezel scale, not the normal watch display. Hence reading the bottom time is not as instant or intuitive as it could be. The short product lifespan of the SM120c means that today these watches are rare and very infrequently appear for sale. 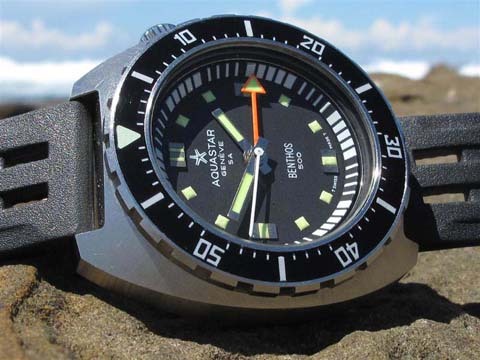 They were expensive watches when new (CHF 715 in 1972) and almost all would have been used underwater as intended. Many would have eventually succumbed to failing seals and other effects of water pressure on ageing watches. 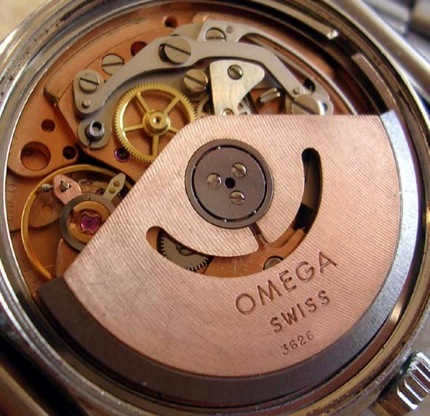 Using the 1340 calibre as a base, engineer Raoul Henry Erard re-worked it to become the Omega Cal. 1040. Both were manufactured by Lemania, while the cal. 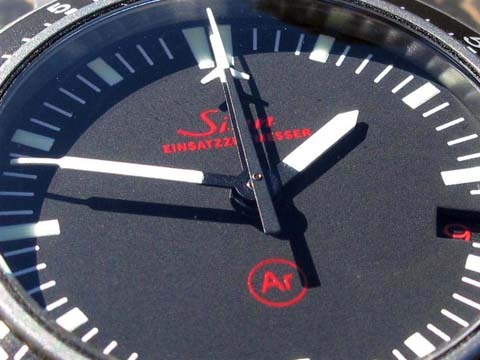 1040 included a 24 hour indication on the sweep second sub-dial at 9 whereas the 1340 does not. Lemania quickly marketed a simplified version of the 1340 with the 17 jewels calibre 1341. There was no equivalent at Omega. 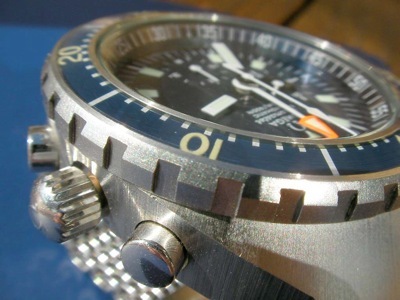 When released the ‘SM120c’ was seen by many as the more expensive diving version of the Speedmaster Mark III. Since the two watches share so many similarities in design and specification, there has been talk that there may have been some official Speedmaster Mark III dialled variants of the SM120c. 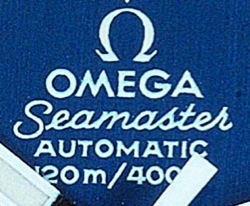 Of course, these models may just be water damaged SM120c’s that were fitted with spare Mark III dials, but Omega themselves refer to the possibility of these models on the Omega Traditions website. 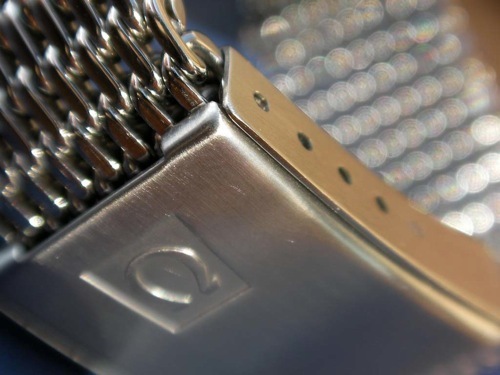 In use it has been found that the Omega Milanese (mesh) bracelet, with it’s mass and contour hugging form, is the ideal partner for this watch. Sadly for the original buyers, it seems most likely from looking at contemporary advertisements that the originally fitted bracelet supplied was the Omega Flightmaster style, which really doesn't do this watch justice. It is not as comfortable to wear as the Omega mesh and its lightweight construction tends to lead to an unbalanced feeling on the wrist. The modern version of the Flightmaster bracelet exacerbates this feeling as it has hollow links and is even lighter than the original. The Milanese was a period dealer option, as were a selection of coloured Isofrane rubber straps. 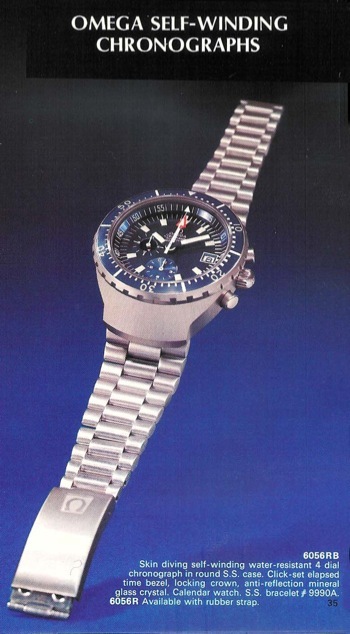 Interestingly, Omega list the watch as available in their International Collection from 1971 to 1973, but the SM120c only seems to appear in the 1974 paper catalogues (if anyone has an earlier catalogue depicting the SM120c please can they contact DeskDivers admin). 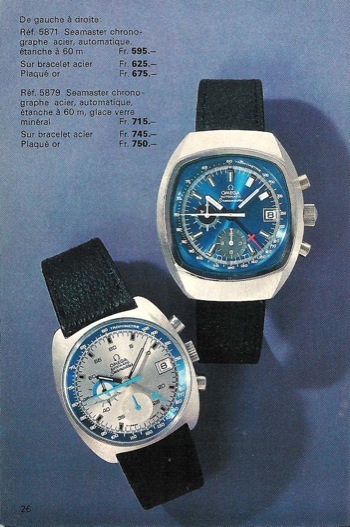 It would also seem that a number of SM120c’s were sold after 1973 leading to speculation that the watch was a slow seller until discounted, or that finally adding it to the catalogue actually generated more sales! 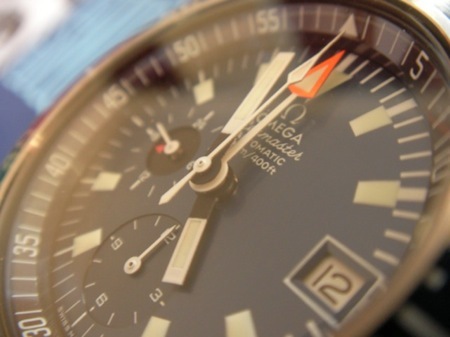 Whether the SM120c was a sales success is not documented, but this would appear unlikely considering its short life span in the Omega range (along with the Speedmaster Mark III, the SM120c was only listed in the Omega range from 1971 to 1973). 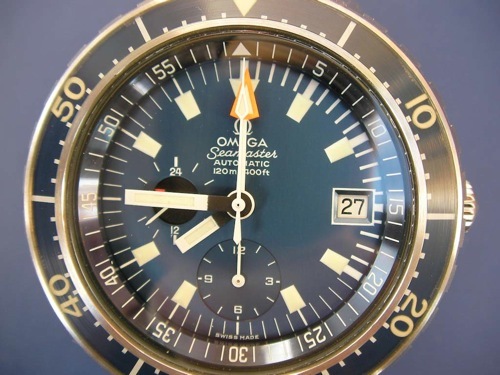 This fact also seems to be underlined by the fact that Omega didn’t produce a replacement dive chronograph for another 19 years, with the introduction of the Seamaster Professional Chronograph Diver (Ref. 2598.80.00). Perhaps it was, like so many great designs, before it’s time? Flightmaster style bracelet – The Omega Flightmaster bracelet (ST 1162/172) from this era is not the favourite choice of owners today due to its rather flimsy, lightweight and thin construction making for an unbalanced feeling when worn on the SM120c. The modern version of this bracelet has hollow links and is lighter and flimsier than the original making it an even worse proposition. 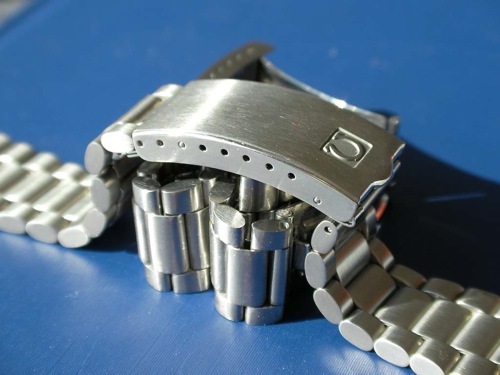 Mesh metal extension 1247/238 - It is worth noting that in standard form even on a large watch like the Sm120c, the mesh bracelets are best suited to those with slim wrists. For those with larger wrists an inch long extension is available. 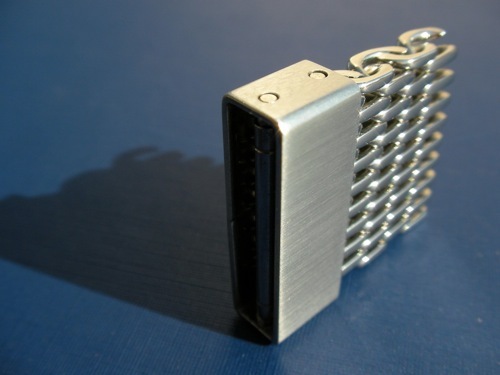 These can be fitted on either side of the clasp and also daisy-chained if needed. 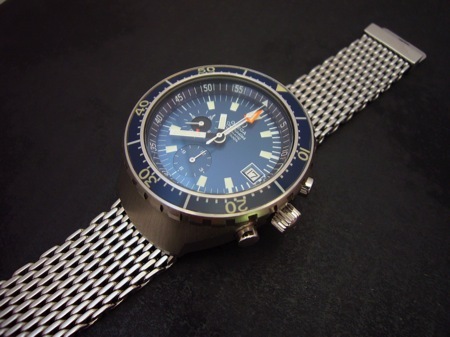 More recently (in the late 1990’s) Sinn used a similar approach on their EZM1 using a cut down Lemania 5100 movement with no subdials and only the centre minutes and seconds hands used. 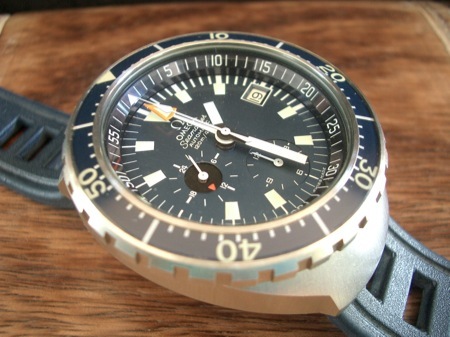 Both Aquastar and Sinn also used a traditional bezel to enable the recording of an extra time point in the dive, if required. 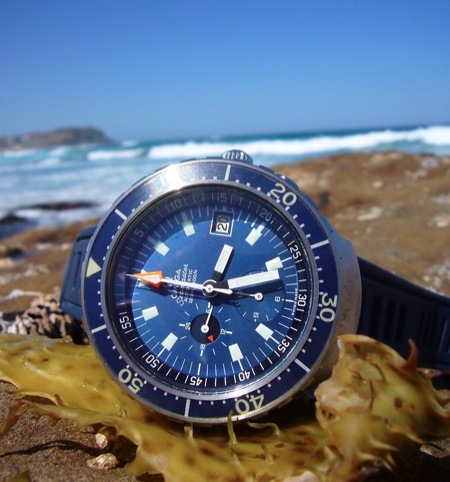 The first of these producers was Aquastar who adopted a similar, although simplified, design concept and used a chronograph movement in the Benthos models (released in the mid 1960’s). However, the watch was limited in that the timer hand is for minutes only. Which after running for an hour, returns to zero. 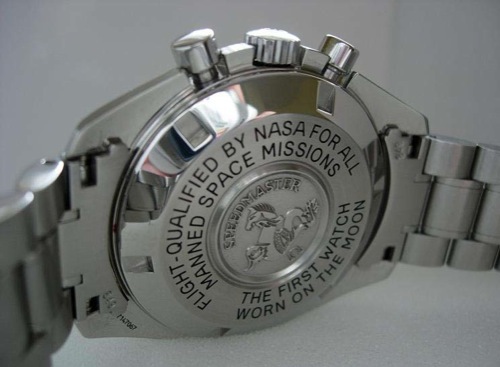 Which brings us to Omega... Having a long history as a producer of chronograph watches and in 1969 taking the honour as the manufacturer whose watch was chosen by NASA to be worn by the first man on the moon. At the same time they were developing watches to be worn in what many would describe as a far more hostile environment than Space, the extreme pressures of the undersea world. The hidden, hooded and non-drilled lugs make for rather more difficult strap changes than one would prefer. They also mean that fitting some types of bracelets/straps can become a precision task to ensure that the springbars are firmly seated. 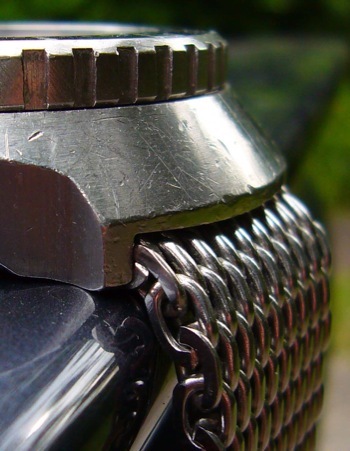 On larger wrists the watch is forced to sit on top of the strap as it exits the watchcase. 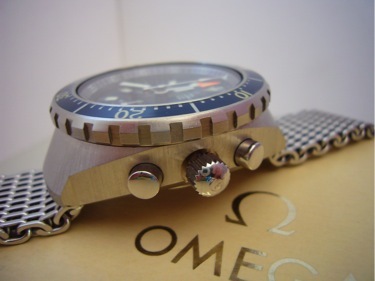 This makes the already tall watch sit even higher, and seems a rare Omega design flaw. 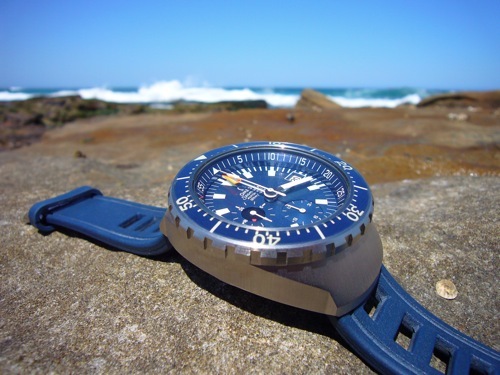 Owning the SM120c is a revelation compared to many of the dive chronographs available today. It is undeniably one of the most attractive timepieces ever made with a very clean, functional, yet attractive look. The deep blue dial and white/orange hand combination is easy on the eye and always attracts attention. The watch is beautifully detailed and has amazing wrist presence. The SM120c is also a vintage timepiece that is ‘modern sized’. These watches are now more than thirty years old, but like other models in the Omega range from the same era, they really do not show their age, due to the quality of Omega’s design and workmanship of the period. The SM120c is easily on a par with the high quality watches of its ilk sold nowadays, and easily surpasses that of the current Omega range. 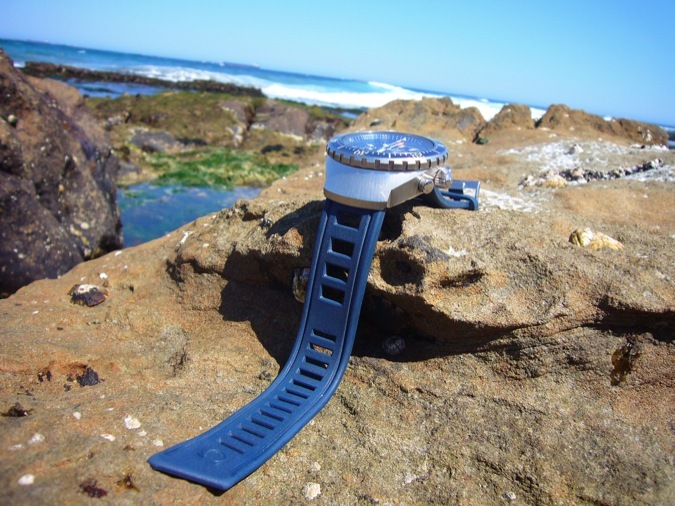 The watch case is milled from a solid block of stainless steel and has been well contoured to avoid snagging when diving. The aggressively contoured bezel running to the extremities of the case (obviously designed to provide a replaceable ‘bumper’ to protect the watch when used for diving) is the perfect width for a modern dive watch. With the right strap it is very comfortable to wear for extended periods. The only issue for some is the height, coupled with the weight, of the watch head. 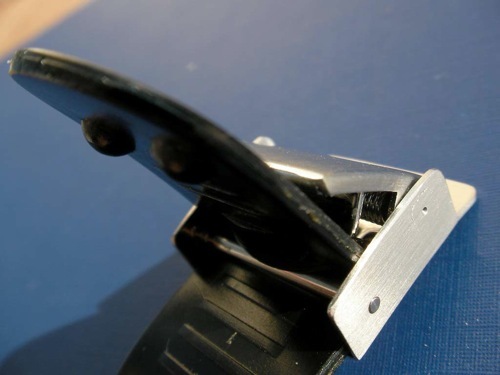 When worn on thinner straps and bracelets these factors can lead to an unbalanced feeling. The high profile also means that it tends to pick up damage from everyday objects. Over time, these deflections pepper the case and are very obvious in the sun burst graining on the steep case sides. 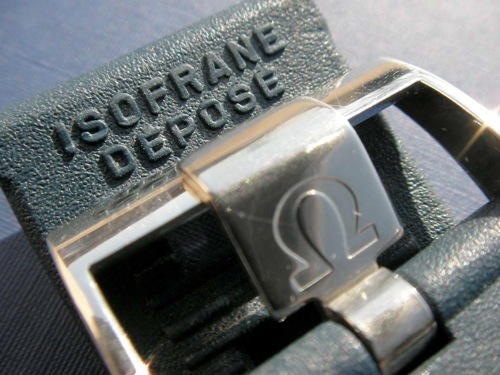 Although, it is worth noting that Omega Bienne can refinish the watch to ‘as new’ condition if required, and in fact they are the only facility that can properly restore this unusual case graining. When wearing the SM120c, the front view of the case is dominated by the stainless steel bezel and its glorious acrylic insert. The indices on the bezel allow for a larger view of the ‘face’ than traditional watches, especially when underwater or in the dark, giving a very clear indication of the minutes elapsed. 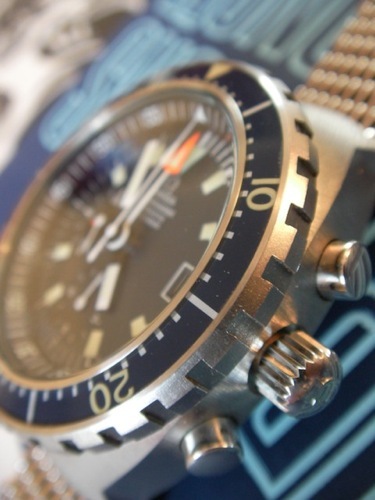 Unfortunately, the luminous material on these bezels is most likely Tritium and its luminescence today is not long lived, due to the Tritium’s relatively short half-life of 12.5 years having considerably reduced the amount of active material. The depth of the insert gives the bezel a very classy look and helps avoid scratch issues since it can be polished, it is worth noting however that the bezel originally sported a radial brushed finish. Despite these advantages acrylic was not really the best choice of material as everyday knocks, and careless attempts to remove the bezel can cause stress cracks and delamination of the acrylic, into which water can penetrate. Almost all SM120c’s (even those freshly restored by Omega Bienne with NOS bezels) show some lifting of the insert on the bezel’s outside edge. The Lemania based Omega movement is solid and dependable with a long power reserve. 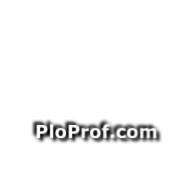 It is relatively vice free and long lived, with the one proviso that the user does not adjust the date when the watch is at the time of day that the date changeover takes place. Doing this can cause a failure of the date wheel mechanism and it is advised that date changes are done with the hands set well away from that time of day, of course this is easily done by referencing the 24hour display. Mesh - Among the most popular bracelets is the Mesh or Milanese bracelet (ST 1247/237). These bracelets are constructed from a 4mm thick stainless steel mesh that suits the 70’s Omega watches perfectly in looks and weight. These bracelets have an airline seat belt style clasp and are very comfortable to wear. The thick mineral crystal is treated with an anti-reflective coating, and sits slightly below the bezel, being protected by its edge. The crystal provides a wide window down to the dial deep in the recess below. 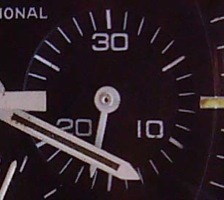 This depth is necessary due to the double stack of hands required to tell the time of day and also provide the chronograph’s centre second and minute functions. 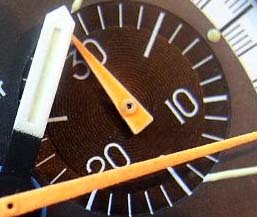 The time displaying hands and dial elements melt into the background when diving, and the diver can instantly see the large bright orange minute counter hand as well as the movement of the large seconds hand, giving immediate confirmation and reassurance that the watch is still running. The steep sided chapter ring lines up perfectly with the length, and height, of the chronograph pointers to easily allow a diver to read their elapsed time from the scale. Beneath the chronograph hands the matt metallic blue dial and timekeeping hands are crisp and clear, allowing easy telling of the time. 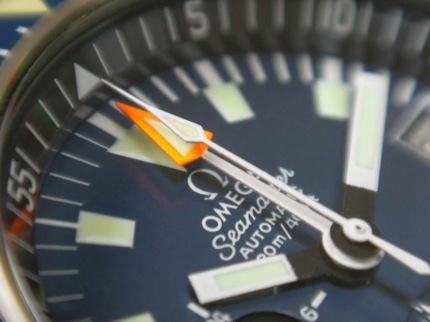 In fact Omega’s use of pointed and blunt hands for different functions is a true example of intelligent design and makes it simple for the user to mentally ‘switch off’ the watch hands that are not required for the current task. On land, the simple (for a chronograph) dial and large watch ‘face’, the blue of the dial / chapter ring and bezel all topped off by the orange and white hands, give a very crisp, clean and classy look. 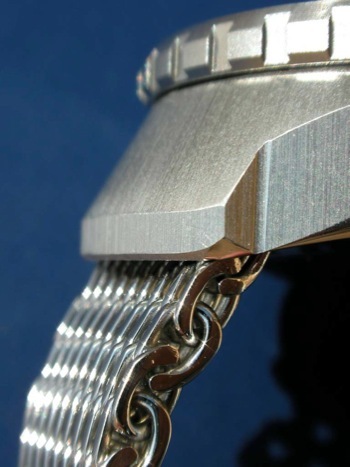 Omega could have relieved this issue slightly by removing the faces of the hooded lugs, allowing bracelets and straps to exit the watch head directly rather than from underneath - they did partially adopt this approach on the Seamaster 1000m version of this case shape. Perhaps at the time of the SM120c’s development, this problem was not apparent due to the thinner wrists of divers in the 60 & 70’s, including Cousteau himself. On a skinnier arm the strap/bracelet exit angle perfectly follows the contours of the wrist and helps stabilise the chunky watch head. An indication perhaps that modern collectors should eat less chips, rather than try to find fault with what was at the time a perfect design solution for a heavy watch head! 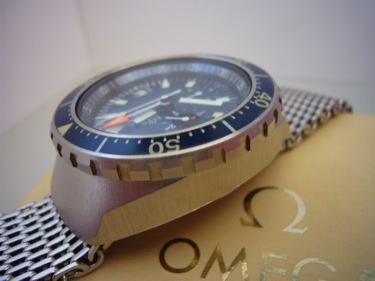 Comex Divers Extension - referred to by Omega as “the offshore bracelet for waterproof watches“ (Ref-1247/239 or both 1247/240). This is a flexible black Adiprene extension piece for the mesh bracelets. This distance piece can very quickly, and simply, be sized to different lengths when preparing for a dive as it has ridges that can be pulled through the clasp and clamped tight. 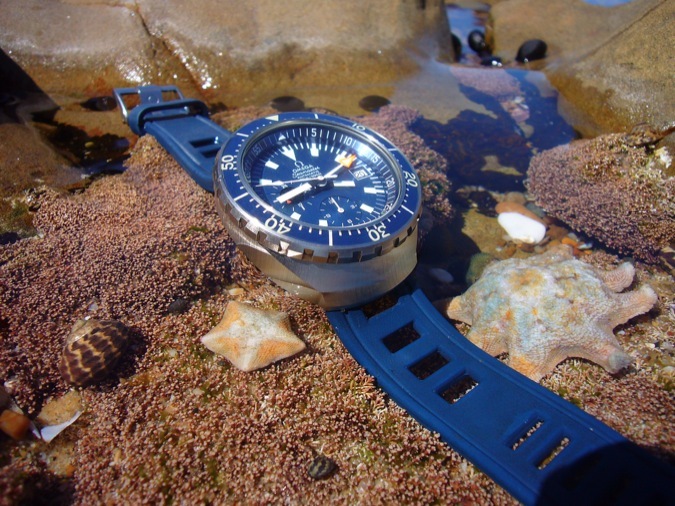 It is a little thin in use compared to the mesh or Isofrane straps and is not something recommended for diving use today, but is worthy of collecting as these are very rare. The large typically 1960’s/1970’s Omega Seamaster crown is easy to set and wind. On most SM120c’s it screws down, but Omega states that some examples were supplied with non screw down crowns when new. The pushers operate with a firm click and are reliable in use. The small size of the pushers and their close proximity to the crown, help protect them from accidentally being pressed when underwater and also help prevent the crown from snagging. 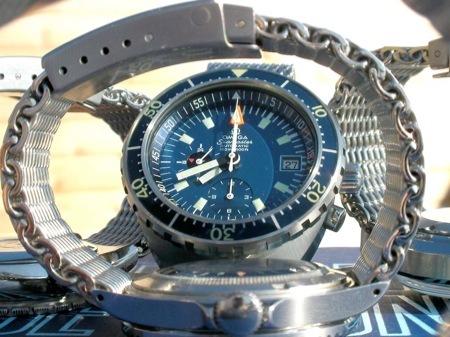 It is understood that divers were not discouraged from using the pushers at depth, which is quite a feat as some modern dive chronograph manufacturers advise against this on their modern watches, of which many have a deeper depth rating and use modern sealing technology. While most recreational dives do not last more than an hour, professional divers working deep underwater, or living at depth as people were keen to attempt in those formative years, would require the capability for longer time recording. With Omega’s knowledge of good design for both chronograph and dive watches it seemed a logical step to produce a proper dive chronograph. With expert input and prototype testing from Jacques Cousteau and other professional diving organisations. In 1971 the diver’s chronograph with centre seconds and minutes, which is the focus of this article, was released - The Omega Seamaster Automatic 120m/400ft (Ref. 176.0004), or as most refer to it, the ‘SM120c’. Naturally, the creation of the Seamaster 120m chronograph is intrinsically linked to that of the modern Omega Speedmaster range which began with the CK2915 model (cal. 321) in 1957 and has continued successfully to the present day. 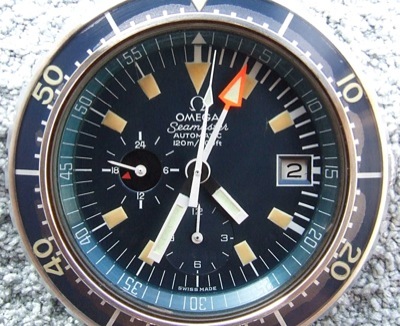 The early Speedmaster models all used Omega branded Lemania movements with subdial minute counters. Lemania was taken over by Bréguet in 2004 and became Manufacture Bréguet, the brand's movement-making branch. At that juncture Lemania ceased making movements for other brands, with the notable exception of the calibre 1861/1863 for Omega's Moonwatch. 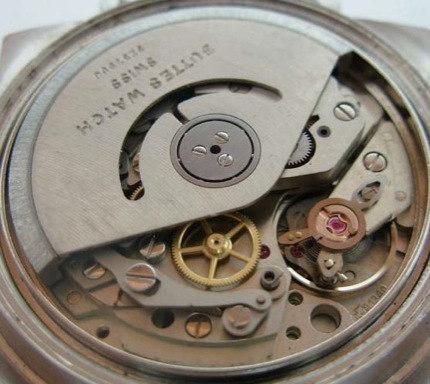 However, in the early 1970’s they were still watch and movement makers in their own right creating the amongst others, the Calibre 1340 movement. Omega set to work to create a watch to use the new calibre and in 1971 they launched the Speedmaster Automatic Mark III (176.0002). Running from 1971 to 1973, the Mark III used the Pilot line (also known as the ‘Flightmaster’ or ‘helmet’) style case shape, with its iconic silhouette it was also used in other Omega watches of the period, including the Seamaster 200m (166.0091), Memomatic (166.0071) and the Seamaster 1000m (166.0093). Interestingly the Omega cal.1040 movement is not a chronometer rated movement, and in 1973 after some fine-tuning to the cal. 1040 the chronometer grade cal. 1041 movement was produced and used in the Speedmaster 125 Anniversary Chronograph, the first ever chronometer grade automatic chronograph. During the production run of the SM120c there were a number of small variations with the model. - The chronograph seconds hand appears in two versions. The Seamaster 300 style was fitted to a small number of models instead of the more usual unadorned long triangle hand. Whilst the SM120c and MkIII are certainly the most impressive vessels for the 1040 movement. 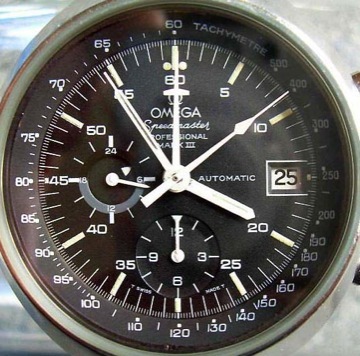 We must not forget that there were other 1040 based chronographs available from Omega at the time. The TV cased ‘Jedi’ and a more conventional cushion cased version. Both Seamasters,each rated at 60m. The 1340 was the first of the automatic chronograph movements beating at 28800. It used 22 jewels and was also equipped with a ball bearing mounted bi-directional winding rotor, patented in 1970 by Piguet. It was well known for being robust and having a large power reserve. - The crown on some examples does not screw down, although most do. 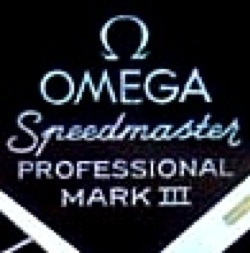 Perhaps this is further evidence of the Speedmaster Mark III link, with crown and tube sharing between early versions. - And of course there is the possibility still, that one may find a rare original Speedmaster Mark III version. There are also tales of a white Seamaster dialled version that could have been manufactured in a small quantities.